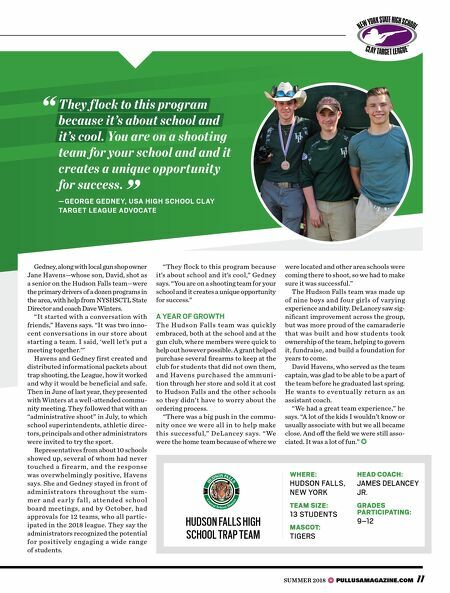 THE LEAD S QUA D SP O T L IGH T 10 PULLUSA MAGAZINE SUMMER 2018 HUDSON FALLS IS A HUB FOR HIGH SCHOOL TRAP SHOOTING IN UPSTATE NEW YORK by JAKE WEYER SETTING THE BAR I T WAS A LITTLE MORE THAN A YEAR AGO that James DeLanc- ey Jr., a biology teacher at Hudson Falls High School in rural Upstate New York, was approached about coaching a trap shooting team. An outdoor enthusiast with some shoot- ing experience, and an eager volunteer for school initiatives, DeLancey didn't shy away from the opportunity, though his expectations weren't high. " I e n v i s i o n e d w e m i g h t g e t s o m e - thing after school," DeLancey recalls. "The school would allow us to call it a club, but it would never be on the level where they 're getting letters and things like that." A lot can happen in a year. This past spring, DeLancey coached 13 students on Hudson Falls High School's first trap shooting team, which is expect- ed to grow to 20 students next year. Each team member—many of whom had never shot trap or participated in other sports before—earned a varsity letter. Not only that, but the nod from the school, the closest one to the Hudson Falls Fish & Game Club, set the stage for success at other area schools. 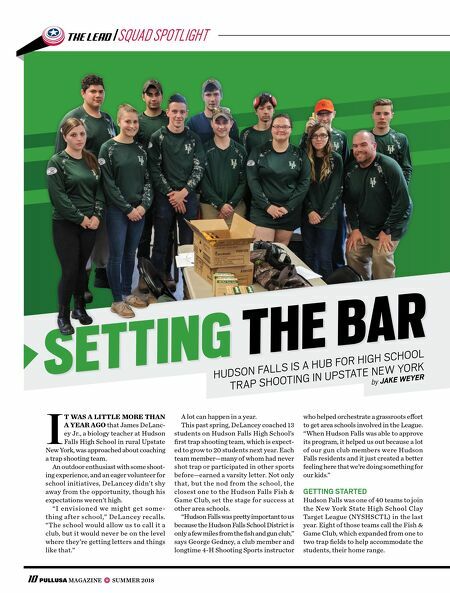 "Hudson Falls was pretty important to us because the Hudson Falls School District is only a few miles from the fish and gun club," says George Gedney, a club member and longtime 4-H Shooting Sports instructor who helped orchestrate a grassroots effort to get area schools involved in the League. "When Hudson Falls was able to approve its program, it helped us out because a lot of our gun club members were Hudson Falls residents and it just created a better feeling here that we're doing something for our kids." GETTING STARTED Hudson Falls was one of 40 teams to join the New York State High School Clay Target League (NYSHSCTL) in the last year. Eight of those teams call the Fish & Game Club, which expanded from one to two trap fields to help accommodate the students, their home range.